Spacex is on run of successful commercial launches. They are proving success for launches and making real their lower prices. Their lower prices will reshape the commercial launch market. NBC News and others report that Spacex had a successful launch today. SpaceX’s Falcon 9 rocket blasted off from Cape Canaveral Air Force Station on Monday to put a commercial communications spacecraft into orbit for Thai satellite operator Thaicom. The 224-foot (68-meter) tall rocket burst off its seaside launch pad at 5:06 p.m. EST (2206 GMT), soaring through overcast skies as it headed toward the satellite’s drop-off point more than 55,000 miles above Earth or about one-quarter of the way to the moon. From that position, the 6,649-pound (3,016 kg) Thaicom 6 satellite is designed to lower itself to about 22,300 miles above Earth and shift the angle of its orbit so that it can be permanently stationed to beam high-definition and digital television services to customers in Thailand and surrounding areas. The satellite, built by Virginia-based Orbital Sciences Corp., also is equipped to provide other communications services for customers in Southeast Asia and Africa, including Madagascar, Thaicom’s website shows. Including launch services and insurance, the Thaicom 6 satellite cost about $160 million, according to Thaicom. So far, about two-thirds of the satellite’s capacity has been sold, according to Thaicom. In December, the California-based firm, owned and operated by technology entrepreneur Elon Musk, who also serves as chief executive of Tesla Motors car company, launched its first commercial communications satellite, staking a claim in a global satellite launch industry worth about $6.5 billion a year, a study by the Satellite Industry Association trade group shows. 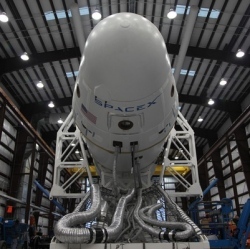 So far, privately owned SpaceX has sold about 50 commercial launches worth about $40 billion. About 25 percent of the flights are for NASA, which hired SpaceX, along with Orbital Sciences, to fly cargo to the International Space Station, a $100 billion research complex that flies about 250 miles above Earth. SpaceX’s next flight, slated for late February, will be the third of 12 station resupply missions under its $1.6 billion NASA contract.